My definition of Religion: A system of stories, rituals and life practices metaphorically addressing basic issues and experiences of human consciousness. I think any means of dealing with conscious existence will involve some kind of narrative, some reflection on it, some application to life, and as such, constitutes religion. This would include people who consider themselves irreligious or anti-religion. In this way I think all humans are religious. If there is one thing that is quintessentially human, it is the making, giving and receiving of stories. These include stories that symbolize the subjective experience of self-conscious existence. If given time to reflect, we all have stories about this. I think we are religious beings whether we associate with organized religion and its metaphorical narratives or not. In my own religious tradition, stories with themes of creation and destruction, homeland and journey, enslavement and liberation, exile and return, birth and death, persecution and power are all metaphors for the human condition, and as such 'really happen' all the time. I think at its core religion is ontological. I think all humans in moments of clarity perceive a great unity of being, of which they are more part and parcel, from which they are less separate. I think the sense of being 'connected to something bigger' is basic to all religion. The Latin verb religare means to 're-bind'. The Latin noun religio referring to obligation, bond, or reverence is probably based on religare, so religio and its English derivation religion connote a 're-binding'. But re-binding what to what? I think religions with their wild diversity are all attempts to recover a sense of being part of this great unity. I think if conditions allow, we develop toward that perception, and along the way basic assumptions behind thought, discourse, and behavior are transformed. I care about religion. Not everyone does. To the extent that it is functional, it is valuable enough not to abandon. At the same time, the more dysfunctional it is, the more it can be both difficult and needful to abandon. It is through the tension between function and dysfunction that I can trace many cycles of abandoning and reintegrating, transcending and including. Some consider religion categorically dysfunctional. I think its application as a direct means of thought and behavior control is toxic; and, as a means of political and cultural control, violent or otherwise, it is socially dysfunctional. It is no wonder some people consider themselves irreligious or anti-religious. It is safe to say that most people do not think of religion in terms of metaphor. Some people understand its narratives in a literalistic way, erasing any distinction between the metaphorical and the empirical as vehicles of reality. This is a hallmark of fundamentalism. It results in either a desperate search for empirical evidence to support naturally impossible narratives, or a contemptuous rejection of those narratives because they cannot be supported empirically. Some vaguely understand religion as getting at something hard to describe, while keeping its narratives compartmentalized from the everyday world of empirical reality. This is a recipe for irrelevance. I tend to think that people are healthier and better developed mentally and emotionally when they can understand what is actually going on with religion, and I think religion functions metaphorically for everyone, whether they understand it that way or not. Five people may take a medication with effective results while understanding it five different ways. One is a biochemist and understands at the molecular and cellular level just exactly how it works. One is fairly well educated and assumes such a process without knowing details. One neither knows nor cares how it works, only that not taking it results in discomfort. One imagines God loving certain people so much as to put it into the mind of some imaginary scientist how to make a medicine so that the people God loves can feel better. One tries to obtain it by any means and takes more than the appropriate dose due to addiction. The point is that the medication works exactly the same way for all, irrespective of how they understand it. For people who understand religious narrative and ritual literally, they still function metaphorically; for people who understand them vaguely and without a lot of reflection, they function metaphorically; for people who are skeptical of and reject them in favor of their own stories, those function metaphorically; and, for people who understand the stories metaphorically, they function metaphorically. I consider faith to be a spiritual practice the same way that meditation, yoga and other kinds of activities can be spiritual practices. My defintion of Faith: A conscious choice to presuppose something irrespective of evidence. Engaging a practice of faith does not require objects of faith to be factual; whether or not they are factual is beside the point. Facts depend on evidence; faith does not. Faith involves examining one's life in light of what is presupposed, and living as though it were true. This is an exercise that connects people with a sense of 'something bigger' and helps them amend their own lives; it does not require a literalistic understanding of what is presupposed. It can be done with eyes wide open. I had to unravel some complex personal problems with the help of Buddhist practice before I could see how Christian faith could also be a practice. Christianity as most widely known speaks of magical transactions, and is too developmentally backward to address any kind of deep psychology; faith as practice is scarcely taught outside consecrated religious communities. I think for it to last into this next millennium (in the industrialized global North—it's booming in the South) a syncretic reinterpretation of Christian narratives toward practices and practicalities of mindfulness and away from faith may be necessary. Ironically this would bring it in line with some of its most ancient concepts and practices. I will be thinking about this for the rest of my life. It was the polite, white, Protestant, Evangelical Fundamentalism of the bourgeois South into which I was born. Many factors have distanced me from that tradition. Education, cross-cultural experience, and reflection allowed me to see how religion is an expression of social structures, material relations, cultural values, and basic assumptions about self and others. A shift toward mainline Protestantism allowed me to objectify religious narrative and move away from literalism. Buddhist meditation taught me to be aware of what was going on in my own consciousness. It also put me in touch with ancient contemplative practices in all religions, including my own. It was at the crossroads of specifically Christian or not, and liturgical or not, that we made the decision to be where we are today. As long as narrative and ritual were to be understood metaphorically, and dynamically with respect to human development, it made sense to go ahead with the narratives of our own culture, expressed through liturgy with all the ritual objects and behaviors that go along with that. Add the need for permission to understand religion the way we do, and the desire for better aesthetic standards, and you pretty much come up Episcopalian. I understand "God" as being a metaphorical personification of the unity of being. I think the ancient Hebrews were onto something with the story of Moses and the burning bush, which includes the deity manifesting in human-like thought and speech, and declaring itself "ehyeh ašer ehyeh" (אֶהְיֶה אֲשׁר אֶהְיֶה), or in a Hebrew future-perfect tense that is very difficult to translate, 'I Am Who I Am' or 'I Will Be Who I Will Be'. This certainly sounds like a metaphorical personification of being to me. It expresses an impulse toward connecting a human sense of being with the great unity of all being. The sayings of Jesus reflect a unique God-consciousness, and he is depicted at pains to explain it. He expresses a personal sense of unity with God, whom he characterizes as an archetypal parent figure, and he wants his disciples to experience the same unity. This is further reflected in writing attributed to his apostles that speaks of people having the right to become adopted as children of God, having the mind of Christ, etc. As one who wants to stay alive spiritually and keep developing, I find that the narrative(s) of my native tradition contain richly applicable metaphors for the joys, indifferences, sorrows, and problems related to the awareness of one's own existence, of loved ones, of all humanity, all life, all matter, all being. the horizon, and everything within it. 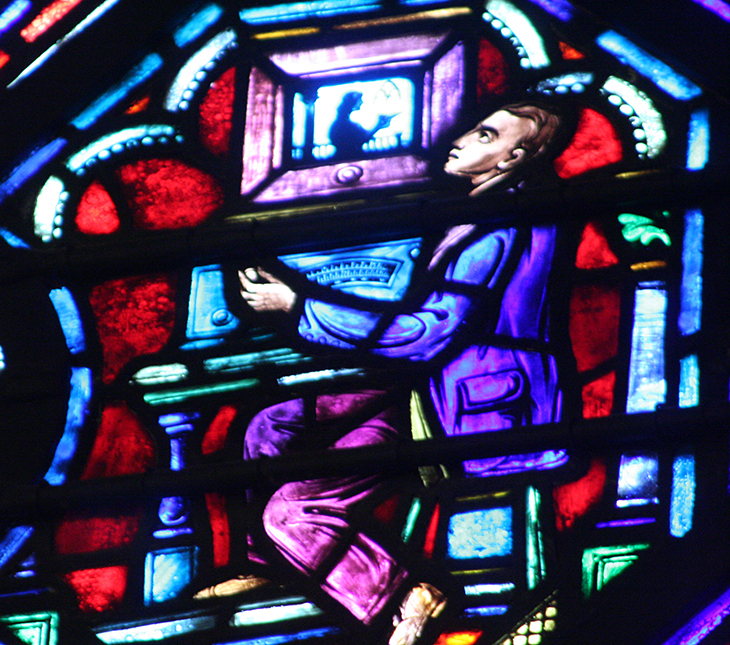 IMAGE: Anonymous, Detail depicting a 1925 prototype television from a Communication themed window bay, Cathedral of St. John the Divine, New York, New York.